Let your skin glow with microdermabrasion. 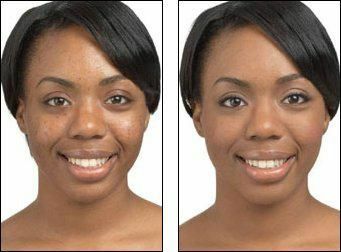 Healthier and more beautiful skin immediately. Also known as crystal peel, microdermabrasion involves projecting very fine medical crystals on the skin, and recuperating waste (dead skin cells, impurities, etc.) at the same time. This treatment removes dead cells easily and without pain and provides a very effective albeit non aggressive cleaning of the skin. Treated areas are usually the face, neck and/or cleavage but could theoretically be made on any parts of the body (back, hands...). 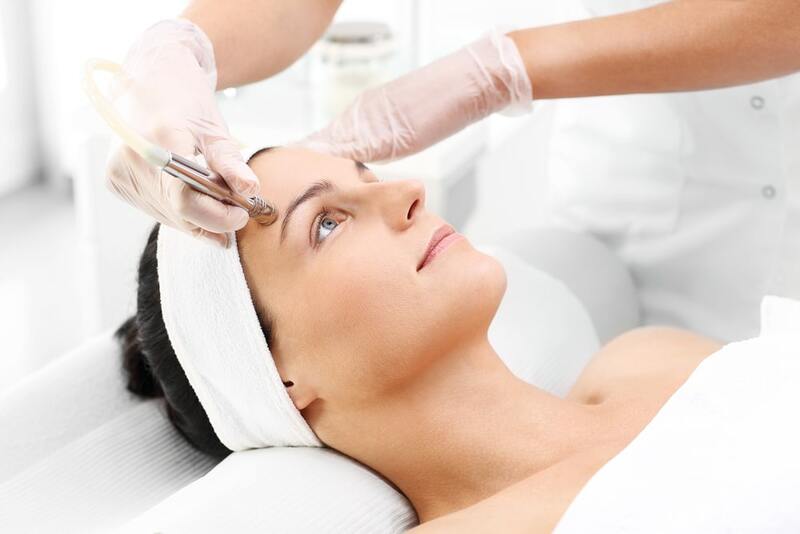 Microdermabrasion can be repeated as frequently as needed. The complexion is improved with a more "healthy" glow. The skin is softer, cleaner, pores are tightened, skin is radiant, rid of its impurities. 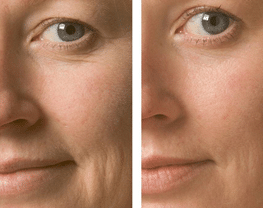 Small lines and wrinkles, acne scars, dilated pores are improved. In our Clinic, we use this procedure primarily to clean and prep skin before other laser of filler treatments. Whom is this treatment recommended for? Appreciated by both Men and women, all skin types and all ages. This procedure improves the condition of mature skin (smoothes and reduces wrinkles, improves elasticity, sun damage), of mixed/oily skin (blackheads, pimples, dilated pores, acne scars). Normal skin will also benefit of this exceptionally effective and risk-free deep cleaning procedure (glow, refined pores and skin texture). Also possible use on body scars, stretch marks, pigmented spots, for very dry or callused hands, arms or legs. Lastly, we recommend this treatment before an aesthetic intervention (laser, mesotherapy, IPL, PRP, etc. ), because a skin free of its impurities and dead cells becomes much more receptive to the procedure, whose effectiveness is tenfold. This treatment agrees with all skin types. As a medical principle, we do not perform any aesthetic procedures on pregnant women. Microdermabrasion should be avoided on a mole or suspect skin lesion, if skin is irritated or burnt after recent sunburn or treatment (exfoliation, laser, peeling), as well as in case of rash, cold sores, active acne, eczema, etc. 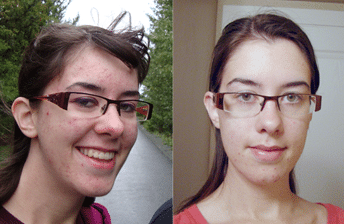 A microdermabration session lasts approx. 20 minutes, or a little longer if followed by a calming or hydrating facial mask. You will lie down on a medical bed, eyes closed during the whole procedure. On a perfectly cleansed skin, the technician starts microdermabrasion, one area at a time, adapting intensity as she progresses. Power of crystal projection and aspiration of impurities are adjusted to skin condition and intensity of microdermabration required. She can also decrease this intensity during treatment for fragile or thinner areas (around the eyes, neck, cleavage, etc. ), to avoid any redness. This non painful, very pleasant treatment (even at maximum intensity) does not irritate the skin. Its primary purpose is to deep-clean and smoothe the surface of the skin, using a gentle and controlled action. During the treatment, microcrystals flow onto your skin at high speed before being removed by a vacuum device. This frees your skin from dead cells and impurities and allows it to breathe again. The microcrystals projected are pure white, whilst residue recuperated after treatment is gray, even when you thought like your skin was quite clean! This is to be expected, as no amount of cleaning at home can tackle pollution, makeup and dead cells present on the skin and in the pores, as well as a microdermabrasion. At the end of the session, your face is rinsed with lukewarm water and, if you have the time, the technician will suggest a calming or moisturizing mask, during which you can relax for 10 minutes in dim light while listening to music. Skin will be radiant and energised, and perfectly clean and soft to the touch immediately after treatment. You can resume your activities directly after the session, and apply makeup if you wish. After micro-dermabrasion, a refined complexion with a natural texture and shine, cleaner pores, a softness are immediately noted. Irregularities and blurry complexion are thoroughly cleansed. The skin becomes increadibly smooth and soft to the touch. Mature skins feel considerably firmer, smoother and more refined. Wrinkles are softened for a younger and fresher appearance. It's the perfect procedure for restoring balance to stressed skin. In the following weeks, more improvement is noted. Free of impurities, your skin can breathe again and is fully prepared to absorb the active ingredients of your day and night care products. Its natural regenerative capacities are also boosted. Clogged pores continue to evacuate sebum naturally and oily or mixed skins progressively regain a healthy and clean appearance. Unlike dermabrasion (mechanical peeling of the skin performed under local anesthesia) which leaves your face red and irritated after treatment, microdermabrasion is deep acting yet gentle and does not damage the skin at all. At the most, a little flush can be observed in highly reactive skins, disappearing fast with no traces. The REVITA derm Skin Peeler Forte which we use in our Clinic is equipped with the most efficient and modern technology available in Microdermabrasion today. It is safe, easy to use and reliable. The Flow of crystals and the depth of peeling is 100% controllable so you can obtain a microdermabrasion as gentle or intensive as you want. This feature ensures a level of safety superior to other mecanical peeling methods available. Makeup is authorised after the session, and you can immediately resume your activities, no one the wiser. Sports and sun are autorised, but we would advise against excessive heat (sauna, hammam, solarium). Due to this procedure’s gentleness, you can have it several times a year if needed. 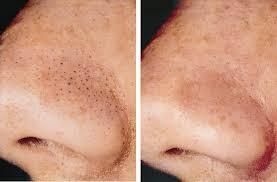 The association of micro-dermabrasions with other rejuvenation techniques by laser, intense pulsed light or injections (botox or hyaluronic acid) gives extremely satisfactory results, as it prepares skin before these interventions and increases their efficiency. Pigmented spots or deep wrinkle will better benefit from several TCA peels to gradually remove several layers of skin, after which we advise one microdermabrasion per year to preserve a beautiful, clean and smooth skin.